Been seeing some gossip spread around about my favorite demon fighter. Apparently Jared Padalecki is engaged? Is this true and is it true love? Much love from across the pond! Engagements (particularly rumored engagements) are like press releases in this town. They're often whipped up with great thought as to how it sounds, rather than how it's actually going to come to pass. Jake and Reese? Casey Johnson and Tila Tequila? 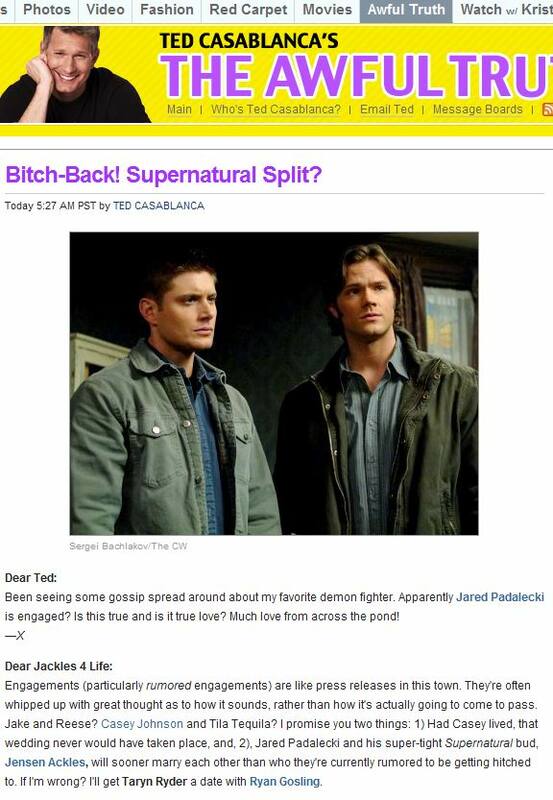 I promise you two things: 1) Had Casey lived, that wedding never would have taken place, and, 2), Jared Padalecki and his super-tight Supernatural bud, Jensen Ackles, will sooner marry each other than who they're currently rumored to be getting hitched to. If I'm wrong? I'll get Taryn Ryder a date with Ryan Gosling.